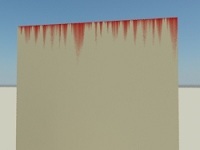 Streaks can be used to add Rich effects like dirt washed away by water/rain, as well as water leaking through gaps on benches. The later yields dark areas thanks to moot and other organic matter that requires regular water supply. 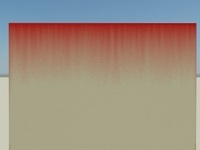 Furthermore streaks can be used to create Rich Splashes. Streaks add plausible and Rich variations to splashes. For best flexibility the Streaks rollup supports seperate streak length and amount for AO and IO. 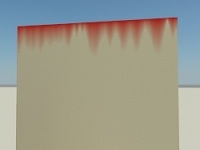 For ease-of-use the RichDirt plugin provides a builtin streak generator - it uses a specialized variation of a ´cellular´ texture. To activate the builtin texture switch this on. 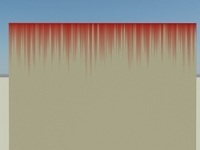 Sets the size of typical streaks (width). Units are always in cm independently from the 3ds Max Units setup. 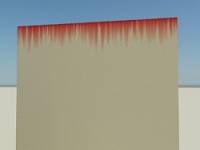 A value of ´1´ means 1 cm typical width of streaks. (1 inch = 2.54 cm). Strict use of centimeter is implemented since real world streak patterns do not change with model size. I.e. 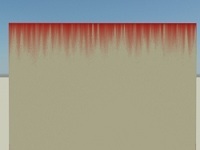 streak widths are the same on a 1000 feet concrete dam versus a tiny concrete cube. 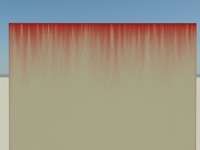 Use small values like 1 or 2 for many streaks. Use large values like 30 to get larger scale variations. Rich variations are nice for both splashes and to add Richness to facades for shots that show the full facade. Small values are interesting for closeups. Activates streaks for AO. Streaks always need an obstacle as start point. AO is done on the -outside- of objects. For a facade and AO this requires an obstacle sticking out of the facade (like a balcony). Activates streaks for IO. Streaks always need an obstacle as start point. IO is done on the -inside- of objects. 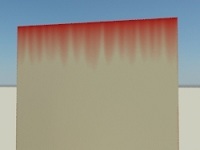 Therefor even a simple wall can trigger streaks (hitting the upper edge). To get nice streaks the cone should be oriented, either via Bias (up or down with positive or negative Bias-Z), or with ´Follow Up Slope´. Amount determines the weight of streaks. It is a percentage between 1 and 100. 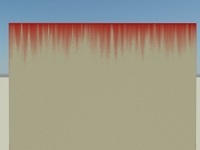 Amount blends between full streaks (washing away dirt) at 100 and full dirt at 1. To switch off streaks do -not- use amount = 0, instead use the For AO / For IO toggles. Amount is interesting for architects, archviz specialist and game designers. Architects: When promoting a new building it should look new, and at the same time ´realistic´ to prove it is a valid design that indeed will exist soon, including better credibility for early rent/sale contracts. Then use small amounts like 20, this way the image will be richer and communicate the real feasability and validity of a design. Archviz: Use amounts adjusted locally to create a great image and communicate the excellence of your renderings. Game Designers: Use high amounts to create industrial and central area buildings. 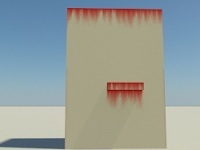 Author presets of RichDirt textures for styles of game areas and levels. Wash Length is the distance streaks wash dirt away, in centimeters. Wash Length can be used to generate a Rich ´wash away´ effect. 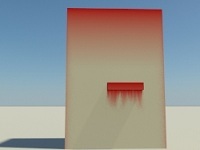 Background: On real world facades dirt/dust accumulates below (window) benches. Rain often runs over the bench or through small gaps in the benches. This water then washes dirt away. 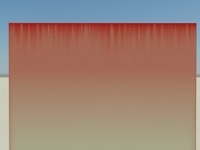 The purpose of Wash Length is to exactly portray this effect. Dirt below Wash Length remains. One can simulate more or less water running through gaps. Wash Length = 0.0 sets the length to infinite, this makes it easy to work with variable Radius. Spread is the spread in degrees, inside the main rollup. It is used for both AO/IO lookup and the streaks lookup. 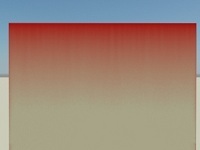 It can be used to generate fine small streaks versus blurred streaks. 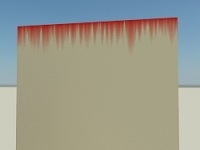 This is a ´Rich´ blur - it looks like real world/wall effects. Dependencies - to control spread seperatly for AO/IO and Streaks use a mixer - mix 2 instances of RichDirt with different spread settings. mental images and mental ray, are registered trademarks, and are trademarks of mental images GmbH, in the U.S.A. and/or other countries. V-Ray and the V-Ray logo are registered trademarks of Chaos Software Ltd. in Bulgaria and/or other countries. Autodesk and 3ds Max are registered trademarks or trademarks of Autodesk, Inc., and/or its subsidiaries and/or affiliates in the USA and/or other countries. finalRender is a registered trademark of cebas Computer in Germany. All other brand names, product names, or trademarks belong to their respective holders.